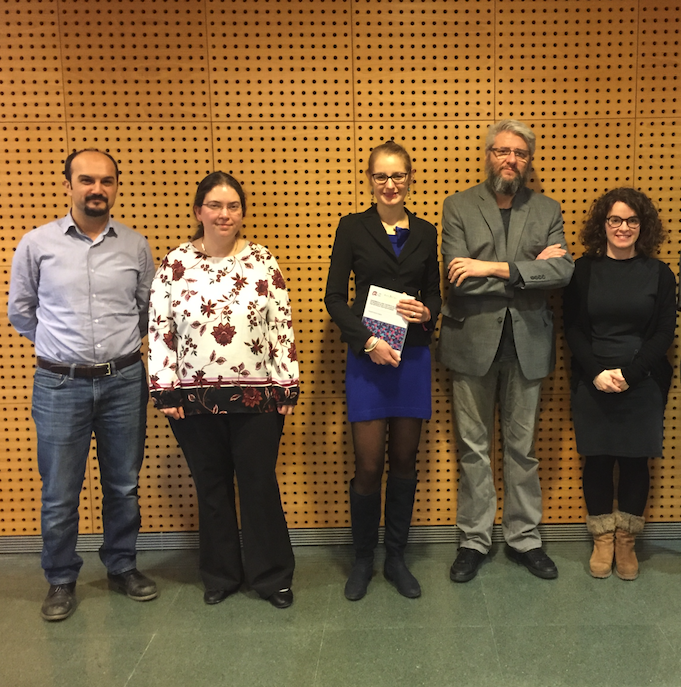 Franziska Hegner, PhD student under the supervision of Prof. Núria López and José Ramón Galán-Mascarós (ICIQ), has defended her PhD Thesis entitled “Experimental and theoretical investigation of Prussian blue-type catalysts for artificial photosynthesis” (assigned to the Department of Inorganic and Physical Chemistry of the Universitat Rovira i Virgili) publicly on January 25th at the ICIQ Auditorium. 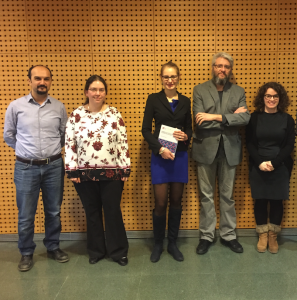 The members of the examining committee were: Prof. Maytal Toroker (Technion – Israel Institute of Technology), Prof. Ferdi Karadas (Bilkent University, Turkey), and Prof. Sara Barja Martinez (Universidad del País Vasco / Euskal Herriko Unibertsitatea). Dr. Hegner is from Wunsiedel, a small town in northern Bavaria where she started her studies in chemistry at the University of Bayreuth. After two years, she moved to the Heriot-Watt University in Edinburgh (Scotland) before moving on to Lyon (France) for her Master of Science at the École Normale Supérieure. After 2.5 years of working, traveling, and volunteering in Asia and Europe, she joined ICIQ for her PhD. In 2015 she received a grant to fund her PhD research from the La Caixa-Severo Ochoa PhD programme. She likes adventures, yoga, and mountains: when she was in Nepal in 2014, she did a 5400-meter pass at the Annapurna circuit. To be very honest, I started to study chemistry by chance! My initial plan didn’t work out: I wanted to become a pilot, but I failed the last test… I decided to study some chemistry – just because in high school I liked it and I was good at it. University and academia were never part of my plan, but as I started studying chemistry, I realised I really liked it and I decided to stay and pursue a PhD eventually. Maybe it’s a bit too ambitious, but I’d like to change the world and make it a better place! So, I want to do science that’s useful for the environment and society; that’s why I’m working with solar energy: I hope to make a positive contribution. During the PhD I learnt to be independent and creative, to design and develop my own research ideas, which I appreciate a lot. As a scientist, it’s also important to learn to stand up and talk about your research to other people, which I learnt by going to conferences and meeting many interesting people. I also liked organising the 1st PhD day, as well as another conference (for young researchers in theoretical spectroscopy); we had to organise everything from scratch: create the committee, the logo, etc. I really enjoyed it, it was very gratifying! What will you miss the most from ICIQ? There are many things I would miss if I leave…. I’ve made so many friends here! I’ll definitely miss our group calçotades, we always laugh a lot and enjoy ourselves there! To be very structured and organised from the beginning: not to start too many things at the same time. It would have been helpful an introductory class – which I think is now in place – where they teach you time management and planning.